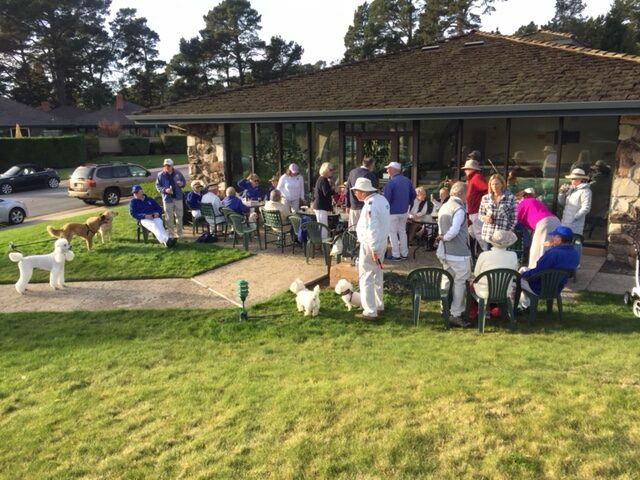 Bowlers, dogs, wine, chips, sunshine. PERFECT! "Bringing bowling out of the alley and onto the lawn"
If tennis, surfing and triathlon-ing aren’t your idea of relaxing summer activities, you could always take a hint from the members of the Del Mesa Carmel Lawn Bowling Club, who gather thrice weekly to roll and consort. They divide into teams of two or three, depending on turnout, face off on a green manicured to rival any at Pebble Beach, and engage for two hours of competition that is leisurely and intense, friendly and cutthroat, all at the same time. Then they adjourn to a nearby patio to boast and commiserate over snacks and beverages. The game purportedly originated with the ancient Egyptians, and evolved with the 16th-century Brits. According to lore, the celebrated British naval officer was lawn bowling at Plymouth on July 19, 1588, passing time as he awaited the arrival of the Spanish Armada. The story — presumably passed along by minstrels — is that Drake sniffed when a scout warned him of the approaching invaders. “There is plenty of time to win the game and thrash the Spaniards too,” the captain supposedly declared. Then, he finished his match, and the British Navy soundly defeated the Armada. The veracity of the tale has been in question for 428 years, but Del Mesa has at least one verifiable legend of its own: Genevieve Cichy, “The Pink Lady,” won the U.S. Open National Championship in back-to-back years. Her first title came in 1990, when, as a member of the Rossmoor Lawn Bowling Club in Walnut Creek, she teamed with Vanitta Olinger to win the women’s pairs division at the national tournament at Bedford Falls, Pa. The following year, with Tecla Shepard as a partner, she won the tournament again at Laguna Beach. Nowadays, at age 101, she only bowls occasionally with her Del Mesa teammates, usually playing just half a game before retiring to a sideline seat to enjoy the rest of the action. Indeed, Cichy was the honored guest for “Opening Day” this year at her old stomping grounds, Rossmoor, where she bowled the first three balls of the tournament. All three rolled to a stop within inches of the jack (a smaller, white ball that serves as the target), which is the whole objective of lawn bowling — and not an easy thing to do. One team might use its balls to block the other. Opponents either curve around the blockade, or blast through, perhaps even bumping the jack to a new location. Balls that wind up closest to the jack earn team points. Players bowl with new teammates in every outing, which enhances socialization and camaraderie. Ginger Andreu, a rookie from Virginia Beach, says she was a reluctant recruit at first. The roster of eclectic personalities populating the club is a big part of its charm. Daskaloff, 88, is a native of Bulgaria. Christiane d’Olive hails from New Caledonia, an island off the coast of Australia. Gerry Sher, the club’s 86-year-old “poet laureate,” is a former “Bozo the Clown.” And Cichy, “The Pink Lady,” is a New Jersey girl who isn’t afraid to share an occasional naughty joke. All but three members of the current club are Del Mesa residents, but outside bowlers and other first-timers are welcome to play any Saturday at 1 p.m. More information can be obtained by contacting club president d'Aulan Gentry at daulan@gmail.com or (831) 595-0905.